One of the biggest allures of the New Nintendo 3DS is the ability to play exlcusive games that the original model just simply can't handle. 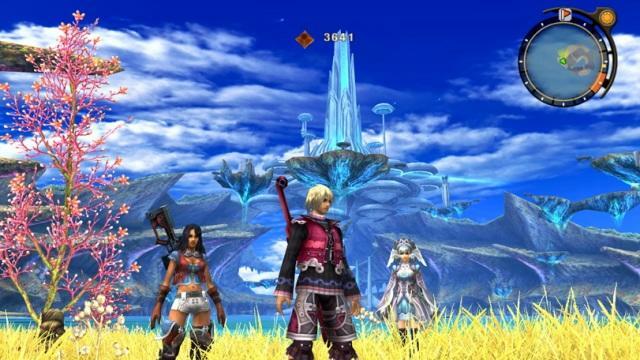 The carrot on a stick that Nintendo is using to tempt fans into updating early is a handheld port of the Wii U fan-favorite JRPG Xenoblade Chronicles. Fans questioned if this version would be coming to the States, and Nintendo has finally put all fears to rest. During its Nintendo Direct presentation this morning, Nintendo confirmed that this New Nintendo 3DS version of Xenoblade Chronicles will be launching in America this coming April. For the most part, it remains the same game, but with Monolith Soft up to its neck in the Wii U JRPG Xenoblade Chronicles X, Nintendo instead turned to Monster Games to hammer out the port. This is the same team who successfully brought Donkey Kong Country Returns to the Nintendo 3DS. I'm a little torn on this version. Like I've said many times, I do most of my JRPG gaming on the PS Vita and Nintendo 3DS these days, and playing Xenoblade Chronicles on the train seems like a much more viable way of putting significant dents into its expansive map and excruciating length. At the same time though, from the trailers at least, a little bit of the game has still been lost in the process, losing the smooth character models and sense of scale a large TV brings. Who am I kidding? I'm going to pick this one up and play it inside and out. Maybe I'm just not a believer in the New Nintendo 3DS' graphical output after all, and this is the game that will change my mind! Keep an eye out for Xenoblade Chronicles this coming April, especially if you missed the incredibly limited run of the Wii version.